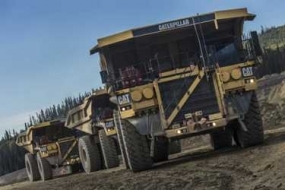 May 1 – Caterpillar recently completed their 5,000th Cat 793 Mining Truck. This 250-ton, 21-foot truck can haul all sorts of materials and has done so all over the world. Savage said the diligence of Decatur workers has helped the truck become successful. “The 5,000 means they have been able to do this consistently for many years and we see them making these machines for many years to come.” The truck parts are manufactured and partially assembled in Decatur but due to the size of the vehicles, they must be assembled on the mining site. The trucks measure 21’ high, 24’ 12” wide, and 44’ 11” in length and weigh 860,000 pounds. The 5000th truck will be delivered to a mining customer in Australia. In addition to using the standard 793, one site in Australia has more than 50 793F Command for Hauling machines that operate without an operator in the cab. The largest populations of 793s are operating in Australia, North America, and South America where trucks mine iron ore, copper, gold, and other minerals. Cat continues to search for workers to join their team to continue manufacturing impressive mining vehicles like the 793. They are currently looking for 340 employees to be welders, machinists, assemblers, and material handlers. If you would like more information about careers at Cat please visit their website.